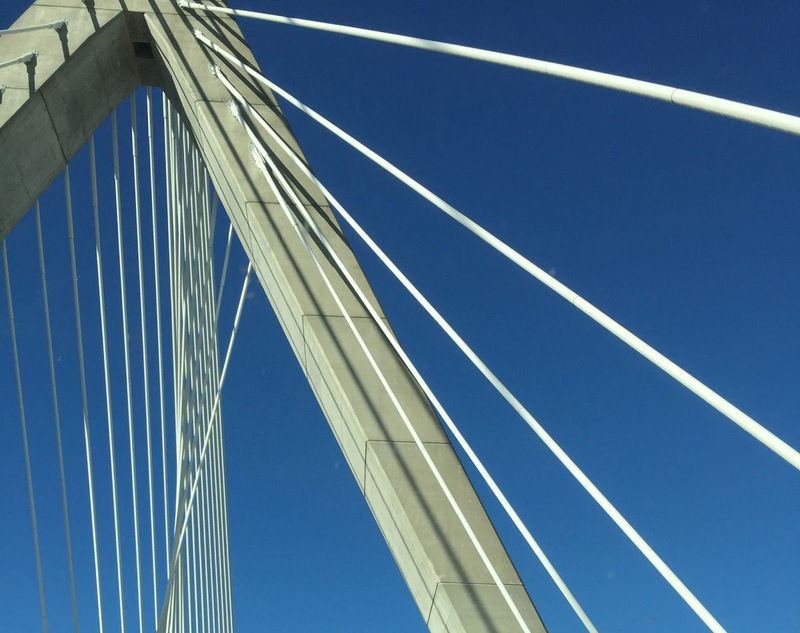 Yesterday we drove into Boston. We started in Cambridge for breakfast and bookstores, and then drove to over Galatea Gallery to check out the show and drop off some paintings before heading home. 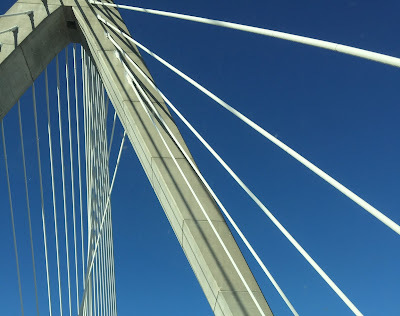 The route home took us north over the Zakim Bridge. Since I was in the passenger seat, I took out my iPhone as we crossed the bridge and took a bunch of pictures. Tonight I cropped this image out of one of the best photos. This landscape is a digital sketch that I started last week, using the Brushes app on my iPhone. But I finally imported the image into the Painter program on my desktop so I could clean it up there. I am almost done; this is the basic image, though there is a little bit of cleanup left to go. Here is the little digital landscape I have been working on. I have been working on this on my iPhone with the Brushes app. But tonight I opened the image in Painter on my desktop, which meant I could work on it on a larger screen. I continued general clean-up, using digital pastel. I reworked a number of trees that looked pretty wild. Then I modified the color of the mountains, road, and bridge. There are still a few things to fix, but I hope to finish this very soon. This is the little digital sketch I have been working on, a landscape inspired by a Thanksgiving song stuck in my head: "Over the River and Through the Woods to Grandmother's House We Go." I worked on this again today, still using the Brushes app on my iPhone. (The screen is so small and I could clean this up faster on my desktop with the Painter program, but would lose the lovely textures available in Brushes.) Tonight I adjusted the perspective and the shape of the road receding into the background. 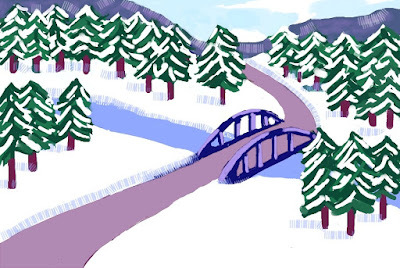 I also reworked the bridge and fixed some more mistakes. Still a little bit more to go. . . .
Tonight after dinner, I finally had a chance to get back to this little sketch. (I am drawing this on my iPhone screen, using the Brushes app.) 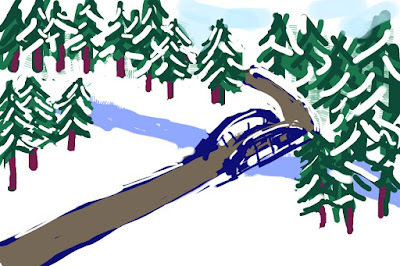 I started by reworking the bridge a bit. I also created a curve in the road in the foreground, and added some mountains in the background. I also added shadows cast by the tree trunks. This still needs some more cleanup, but it is getting there. Here is the little sketch I have been working on, using the Brushes app on my iPhone. Today I continued my effort to neaten up the trees, added a little depth to the snow banks, and changed the color of the road. Not easy on an itty-bitty screen. I may have to switch to my desktop to finish this. Meanwhile, this sketch is still a work in progress. Here is the digital sketch I started yesterday, working on my iPhone with the Brushes app. Today I put in a little time on this, adding a new color for the tree trunks, and straightening out the trees a little bit. Drawing on my iPhone is great because I can draw whenever I have a few minutes; the problem is that the screen is so small. To be continued. . . . I had a song running through my head today, something about the river and the woods and grandmother's house, so I started this little sketch on my iPhone, using the Brushes app. 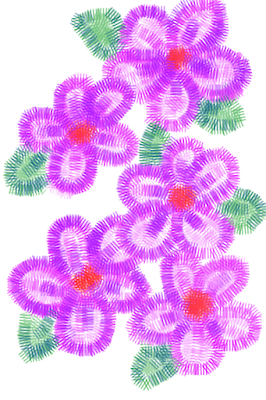 I have been posting images of some digital daisies that I drew with the Brushes app on my iPhone. Why daisies in November? No idea! In any case, I need to move along to other things, but there was just one last thing I wanted to do. Although I finished the drawing (colored in the flowers and leaves and added a brown background), I also liked an earlier version of the daisies, just a sketch on white background. I saved a version of the drawing each day, so it was easy to return to an early sketch. It was pretty rough, but I opened it in Painter on my desktop. I added space to the top and sides of the image to get it centered, then used some cut-and-paste and digital pastel to do a quick clean up some mistakes in the image. 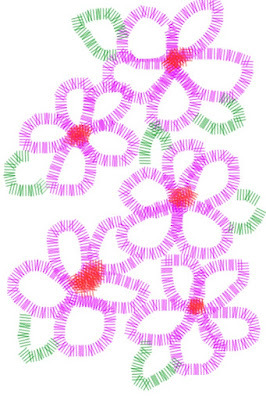 When I was finished, I "captured" the image as a pattern, and here it is. 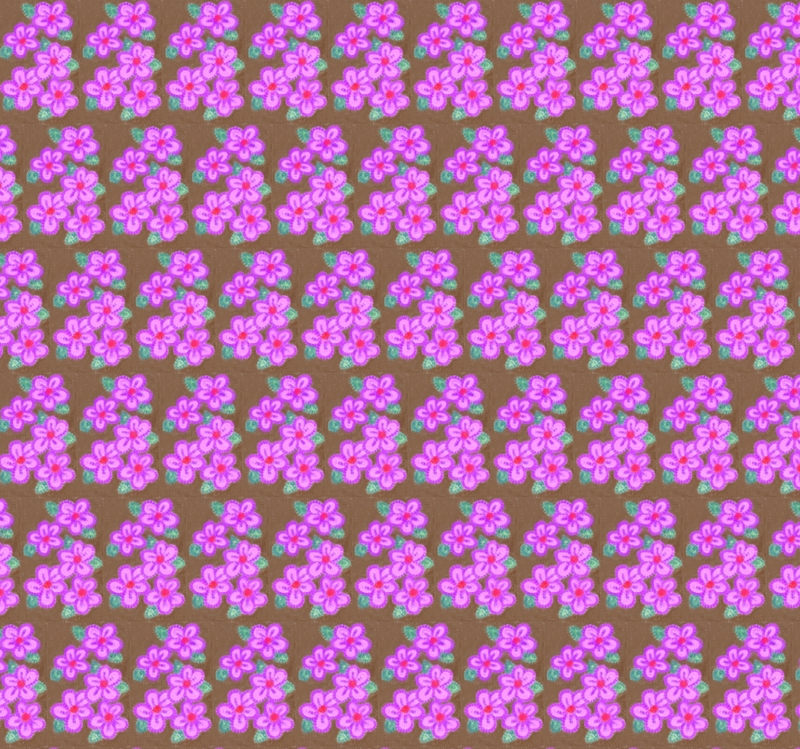 I used my Painter program to create another digital daisy pattern. This time, I used the latest version of the drawing, with a woodcut effect added. (See yesterday's post). This pattern is easier to see because there are fewer repetitions. 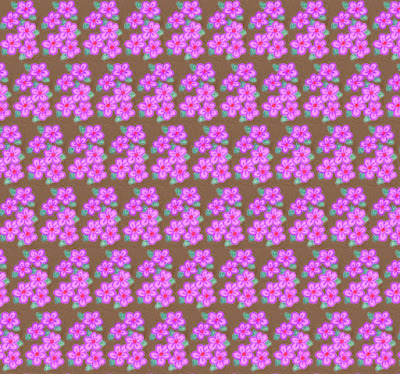 And it is not offset (runs straight up and down), although the position of the flowers makes it look like there are diagonal lines. Here is the digital drawing of daisies I recently finished, but this time with a bit of woodcut effect added. I drew most of this using the Brushes app on my iPhone, but did the final cleanup on my desktop computer with my Painter software. While I was working in Painter, I decided to try the woodcut effect on this drawing to seesee if a little bit of woodcut would accentuate the texture that you get with the Brushes app, and it worked. I also made a pattern from this one, which I plan to post here tomorrow. 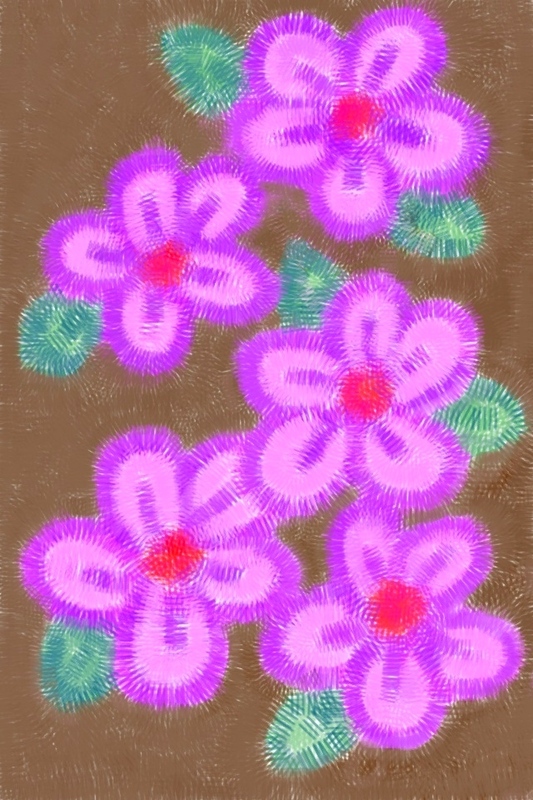 Last night I finish my digital drawing of daisies. I drew most of it on my iPhone with the Brushes app, but did the final cleanup on my desktop computer, using my Painter program. Then I used Painter to create a pattern from the drawing. Here is how the pattern looks. This version is offset (copies of the design are not aligned directly vertically or horizontally). It is harder to design with patterns that are offset, but still I like the way this looks. 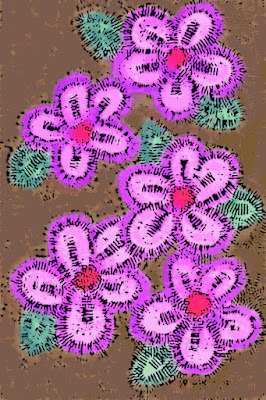 Tonight I finished this little digital drawing of daisies. 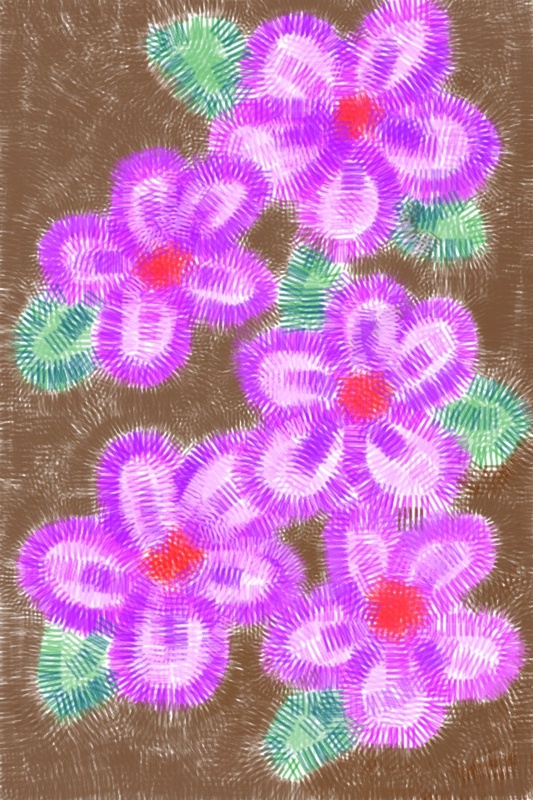 I started this several days ago using the Brushes app on my iPhone. I did as much cleanup as I could in the Brushes app, but I am basically painting with my finger on a tiny cell phone screen, so what I can do is limited. So tonight I opened the image in Painter on my desktop and did some cleanup with digital pastel. I made the pastel somewhat transparent to preserve the texture that you get in the Brushes app. 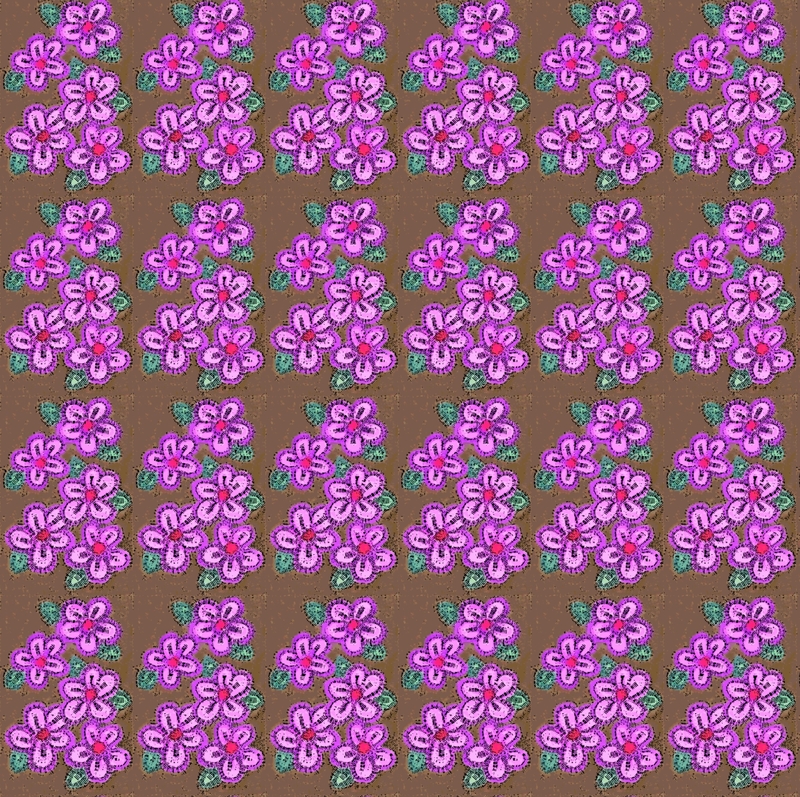 Mostly I tried to cover up little white spaces near the edges of the flowers and in the background. 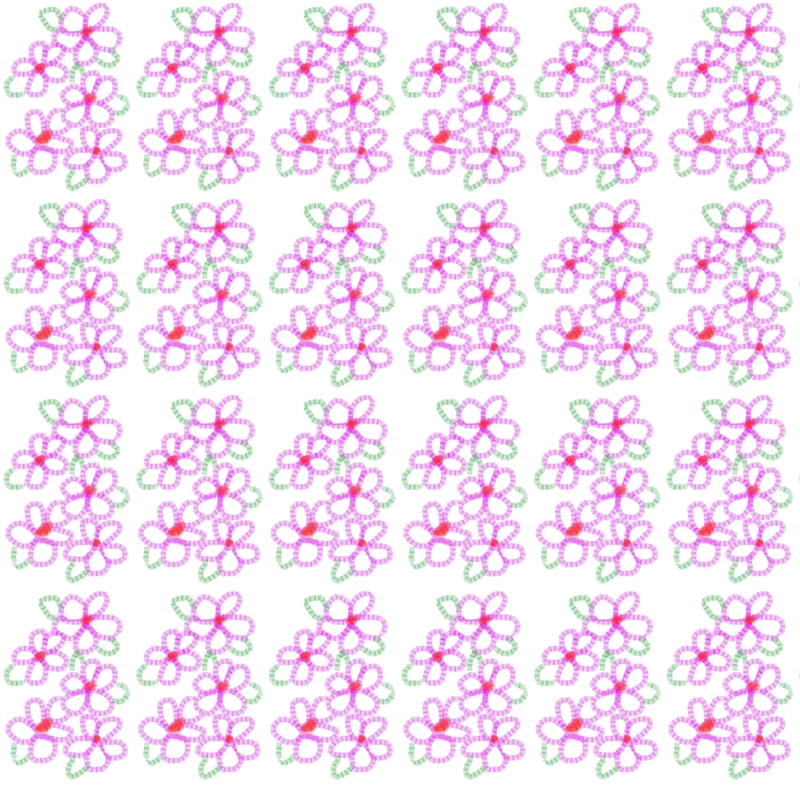 So now this is done, and I am going to use these daisies to make things on the Zazzle site. 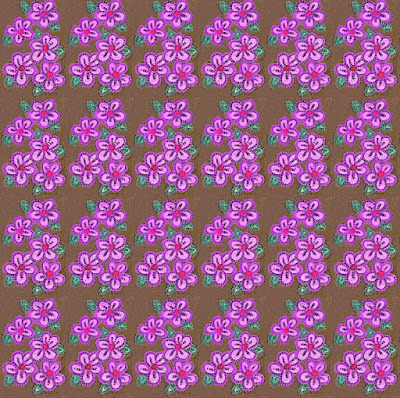 But before I left Painter, I used this image to make a pattern. I also experimented with a woodcut version. I plan to post these soon, so you haven't seen the last of these daisies. Here is the digital drawing I have been working on. I started this a few days ago, using the Brushes app on my iPhone. Today I kept going, cleaning up the lines and heightening the colors. I am still working on it using my iPhone Brushes App, but the screen is very small. I may have to finish the cleanup on my desktop, with Painter. But in any case, it is almost finished. 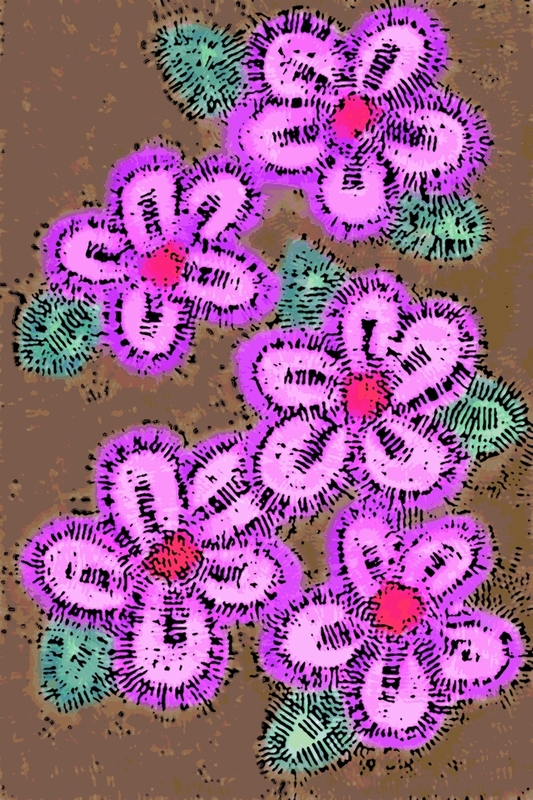 Here is my little digital drawing of daisies. I started this drawing a few days ago, using the Brushes app on my iPhone. Today I continued working on the background and cleaning up mistakes. I am still working on this on my iPhone, so the image is very small, although I can "zoom in." Just a little bit more to go. . . . Here's the little digital drawing I have been working on, using the Brushes app on my iPhone. Today I started putting in some background. This is still a work in progress. Two days ago, I started a little digital drawing of daisies, using the Brushes app on my iPhone. I worked on it again yesterday, and here is what it looks like at this point. This is still a work in progress. I plan to keep going. Right now the composition is a bit off center, but I can fix that later. Tonight I am re-posting this image of Paris on a far happier day. I took this photo during our trip to Paris in the summer of 2011. 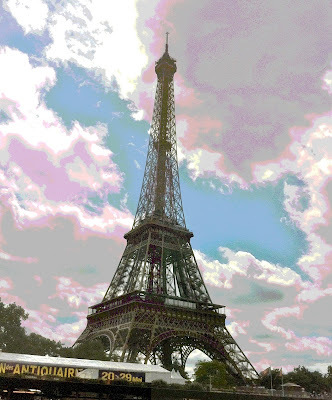 It's harder than you think to get a good photo of the Eiffel Tower. But I tried. This is a posterized version of the best picture I took. The song says, "I love Paris." And I do. I had a busy schedule today, but scraped together just enough time to get this little drawing started. I drew these little flowers with the Brushes app on my iPhone. 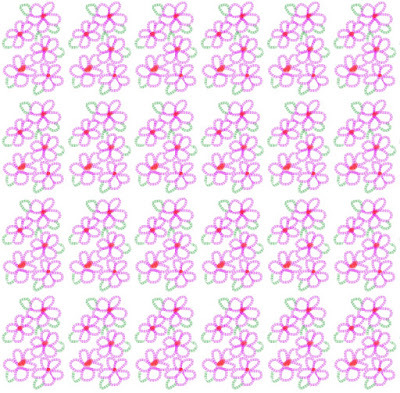 This drawing is a pretty simple, but I think these digital daisies have potential. To be continued. . . . This image started with a snapshot from my mother's old World War II album. My father was born in Brooklyn, joined the army during World War II, and in 1943 was stationed in Pueblo, Colorado, where he met and married my mother, who went to the USO dances. Soon after they married, my father was sent overseas. While he was away, my mother kept an album that included pictures of events at home in Pueblo, but also the photos that my dad sent in his letters. A lot of what I know about my dad's military service comes from this album. 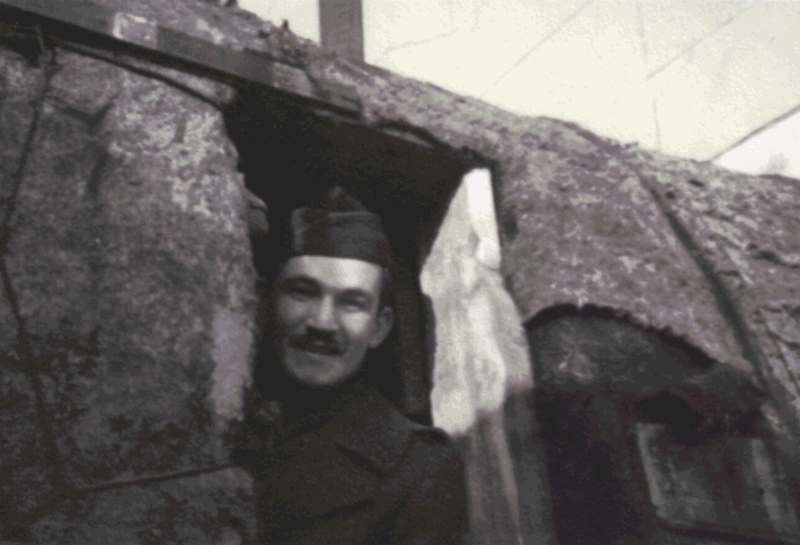 (I hope to know more and recently sent off for his military records.) On the back of this snapshot, someone wrote "Zig in shelter in St. Paul's", probably written by the friend who took the picture. Zig (short for Zagon) was my dad's nickname in the army. From other photos in the album, I know my dad was stationed in England for part of the time, and there are several pictures of him in London, sightseeing with some army friends. (If you want to see related images of my Dad seeing St. Paul's, see my posts for August 28, 2006 and June 20, 2010.) Anyway, the shelter was just part of his visit to St. Paul's during a bit of time off, still it is a reminder that World War II was not just in the background, but was the reason my father had left home, left his brand new wife, and had gone overseas. Today I cleaned up the original photo and cropped it to get this composition. Then I used Painter to add color, using color overlay, posterizing, and woodcut effect. Here's just one more photo that I took at Long Hill Gardens at the end of October. 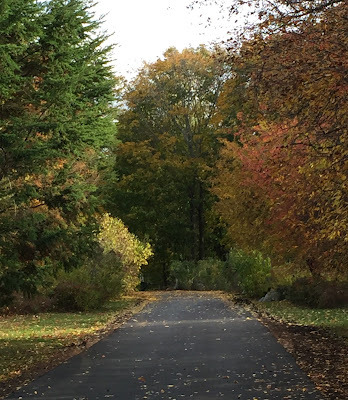 (Long Hill aka Sedgwick Gardens is formerly a private estate located here in Beverly, MA. Now the property is owned by the Trustees of the Reservation and the grounds and gardens are open to the public.) I like the apricot glow of those trees. 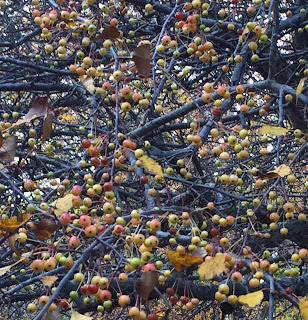 I know its just crab apples and berries, but it looks plenty magical to me. Tonight I did a little retouching and cropped the original photo to get this composition. Yesterday I posted a photo that showed a few leaves of the American Sweetgum tree. I took the picture at Long Hill Gardens during a recent walk. Here's another photo; this one shows more of the starfish-shaped leaves. 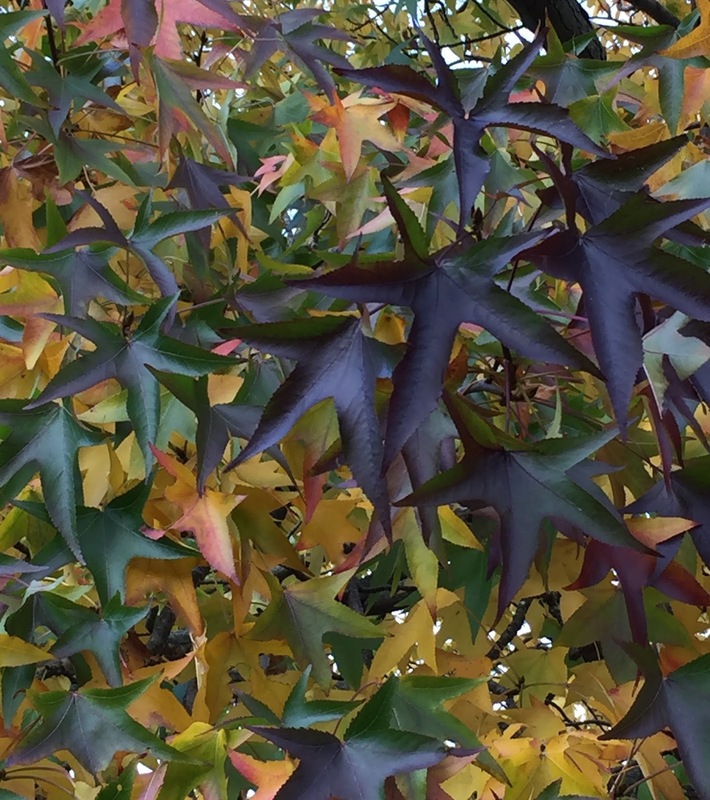 And in the fall, as the leaves turn, the tree becomes multicolor: green, yellow, red, and purple. 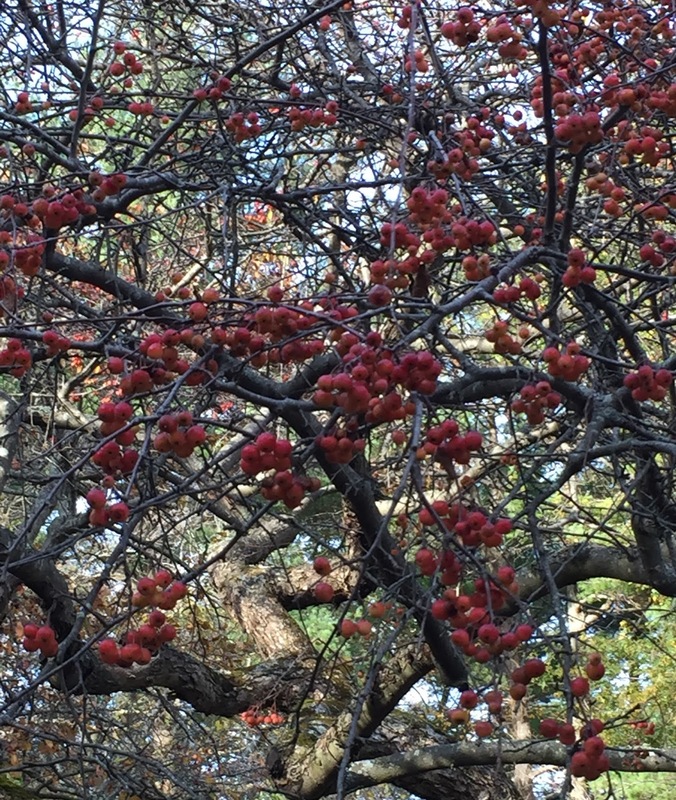 During a late October walk at Long Hill Gardens, I noticed this tree that I have often overlooked, maybe because it is so close to a row of ornamental flowering trees. 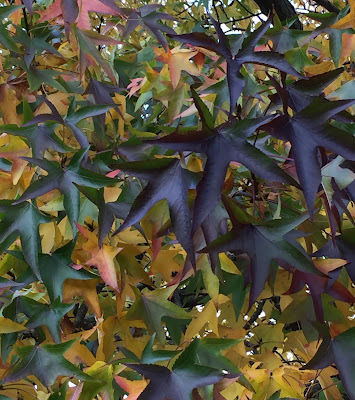 But I noticed it this time, maybe because as the leaves were turning colors, the tree became multicolored: purple, red, orange, green. And that made the star-shaped leaves more obviously. 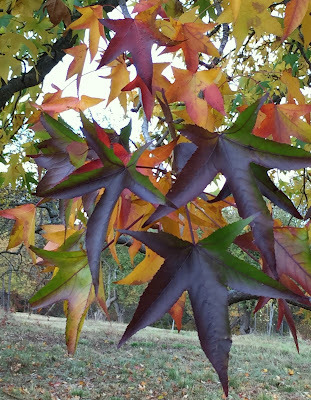 I went closer to take some pictures and noticed that the tree was marked (like a lot of the trees at Long Hill), and it is "American Sweetgum". I think it's a great tree, slightly comical. I said to my daughter, who was with me, "That's the kind of tree Dr. Seuss would make. . .if Dr. Seuss made trees." And she said, "But Dr. Seuss did make trees." And she was right. He did. Yesterday I posted a photo of the main road at Long Hill Gardens, lined with ornamental trees. 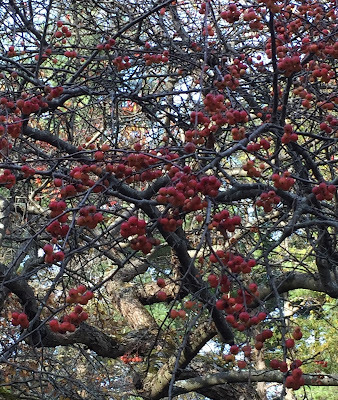 Right now, those trees are full of berries. This is a close-in view of one of those trees. Tonight I cropped the original photo to get this composition, and did a little bit of retouching. Yesterday I posted a photo of the main road at Long Hill Gardens, leading down the hill towards the fields. Here is the same road, with the camera pointed in the opposite direction, towards the house and formal gardens. This tree-lined road is beautiful in every season. In the spring these trees are filled with flowers, and it is amazing to see. But this time of year they are also lovely, filled with apples, crab apples, and berries. This composition is just as it came out of my iPhone camera, but I did have to adjust the color a bit because it lost a little in translation somehow. 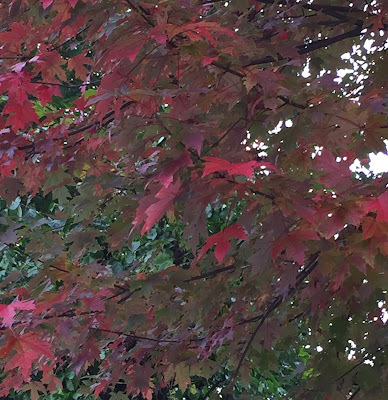 The weather has been good and the trees are beautiful this fall, so I have been taking a lot of pictures. Here's one that I took at Long Hill Gardens on October 29. 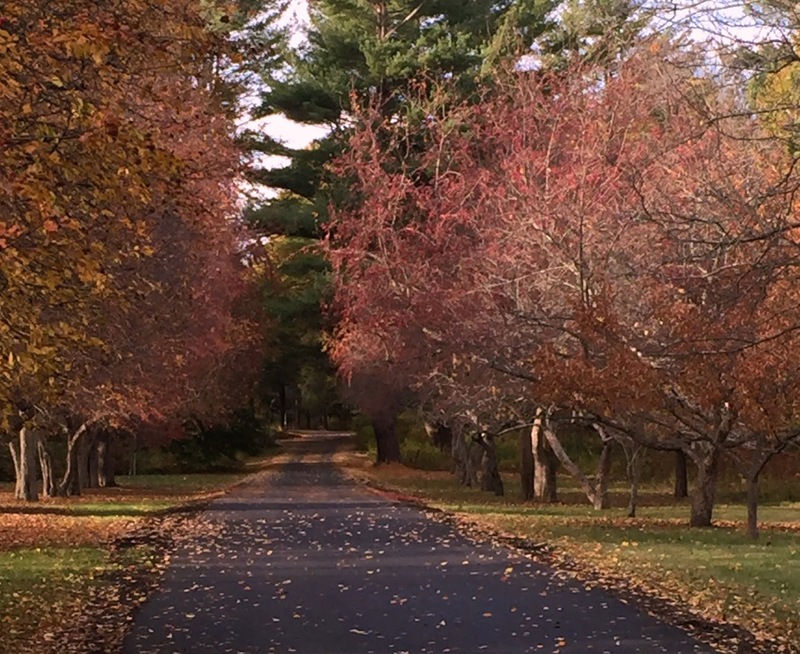 This is on the road heading down from the main house and gardens. (Long Hill Gardens, AKA Sedgwick Gardens, used to be private, but now it is open to the public. I think it is one of the best-kept secrets here in Beverly, MA.) Well, I really liked the way the road looked in the late afternoon light. But I didn't post it right away because right in the middle of the gorgeous foliage was a dark green sign that said "15 Miles per Hour". So tonight I opened the original image in Painter and got rid of the sign with a little cut and paste and some digital pastel. Then I cropped the image to get this composition. This is a photo that I took during a short walk to a corner grocery in our neighborhood. 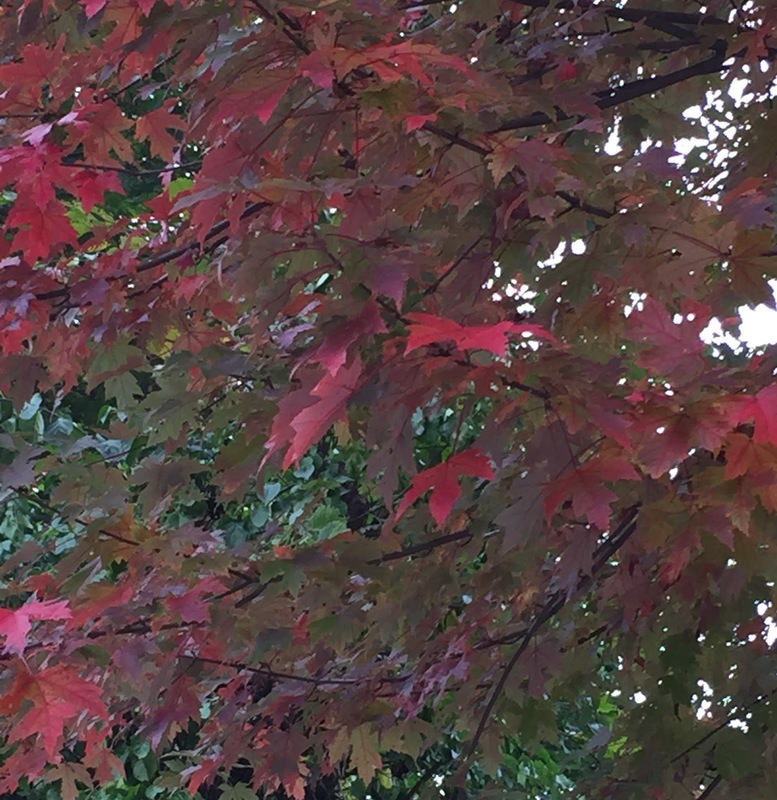 I love red leaves so I stopped to take some pictures. Tonight I cropped the best one to get this composition. Lots of people travel quite a distance to come to New England to see the fall colors, but this was just around the corner. Fall is beautiful here and we have had some nice weather, so I have been taking a lot of pictures. 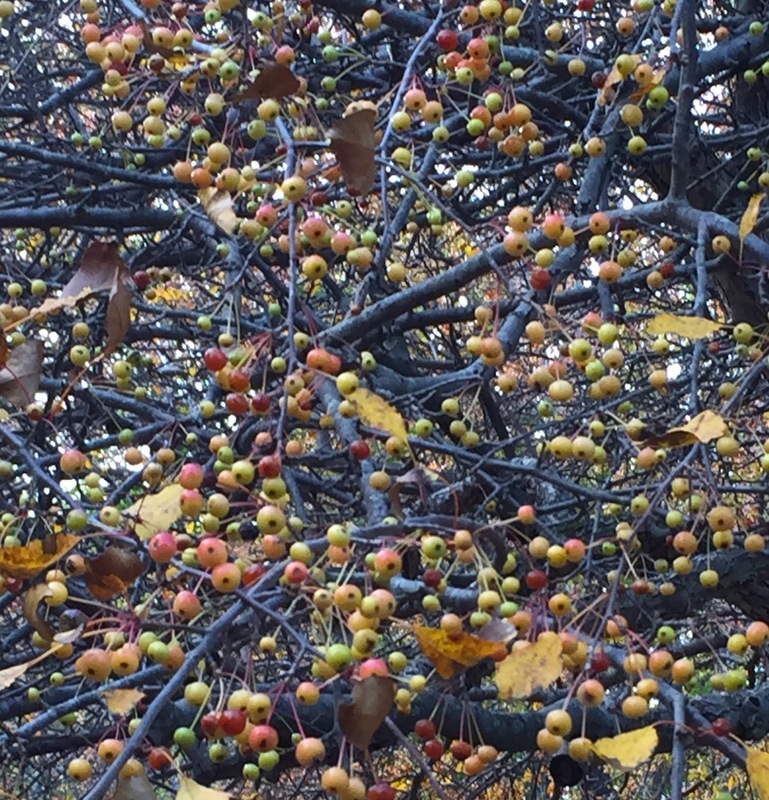 Here's one I took recently of crab apples on the tree at Long Hill Gardens, right up the road here in Beverly, MA. 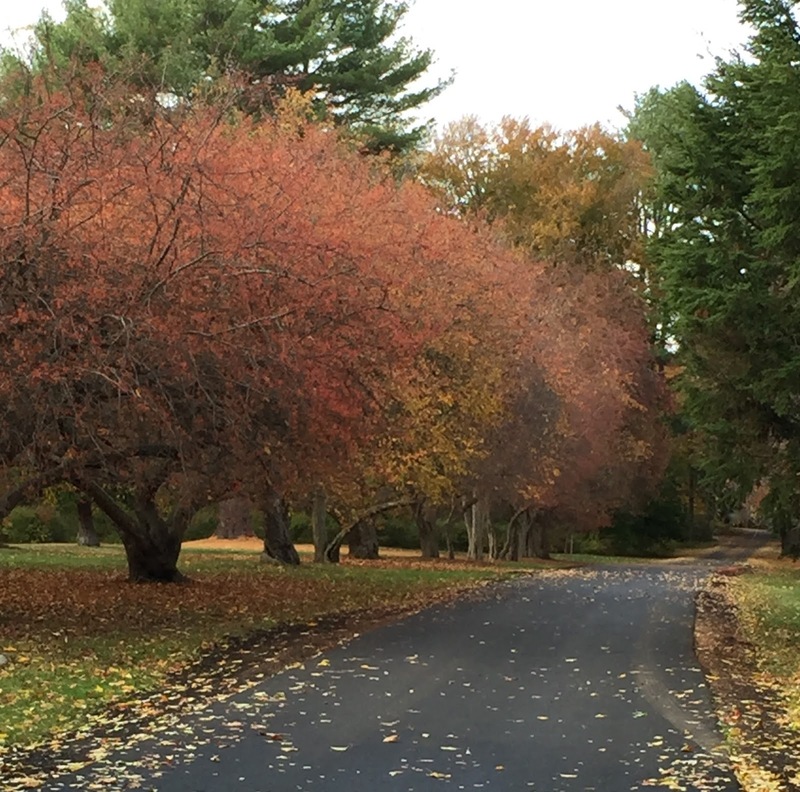 There is always something to see, including a lot of ornamental trees that are still very beautiful even after they lose their leaves. 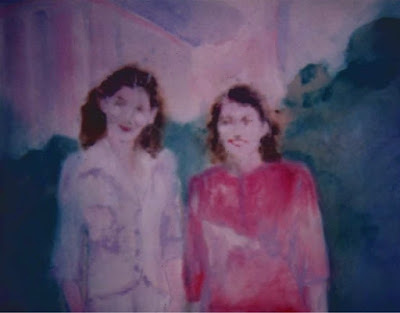 I painted this some time ago from a snapshot of my mother and my aunt. This is acrylic used as watermedia on watercolor paper. I have posted this before, but I am posting it again today cause my mother was born on November 2nd. Yesterday's post was a little trick (or treat) for October 31, a digital woodcut in orange and black. Today I am posting the original, which looks strange enough, even without its Halloween costume. This is a yellow farmhouse on the grounds of Long Hill Garden; I took this photo from my car on a very rainy day. 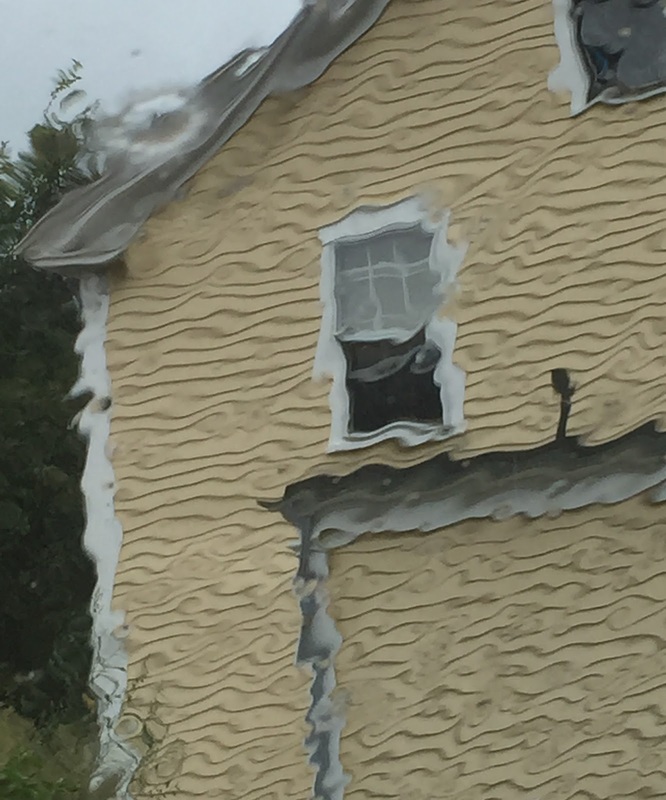 The raindrops on the windshield created the swirly effect, which was enhanced by Painter's "woodcut effect," and it was easy enough to change the color of the house from yellow to orange.